Philanthropy comes in many forms, and it’s top of mind this time of year. Discover some of the ways that businesses, employees and owners can further their business goals while doing something good for the community. Visit any fundraiser event for the Barrington Area United Way (BAUW) and you’re likely to spy Patty Jacobsen’s name among the event sponsors. Her independent insurance agency, Jensen Jacobsen & Associates, in Barrington, is a regular financial supporter. In her free time, she also provides volunteer service. When Patty began volunteering with BAUW, she was amazed at the array of nonprofits she touched. Working with the allocations committee allowed her an intimate window inside the groups that receive funding every year from this leader in local philanthropy. Supporting charitable causes is a matter of personal obligation for Jacobsen, whose father, Ralph, started Jensen Jacobsen & Associates in the 1970s. She assumed the lead about 12 years ago and now works alongside her daughter Anne. This time of year businesses of all sizes join the feel-good spirit of the holiday season and look for ways to support charitable efforts around the region. There are many ways to make a charitable investment. Businesses may give back as an organization, or they may draft employees into volunteer service. Business owners may reach into their own pockets, supporting community initiatives in their own name or that of their business. Sometimes, families or corporations establish foundations to lead philanthropic endeavors. 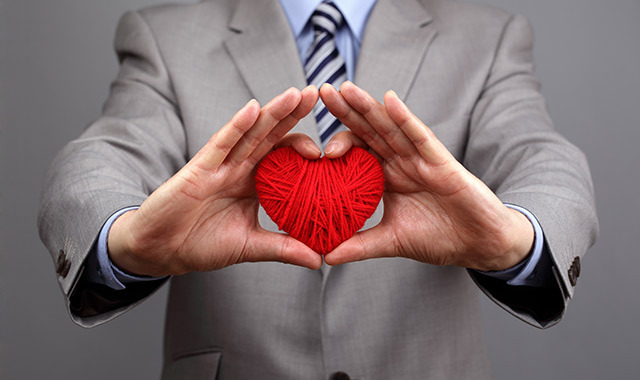 Businesses that wish to give back to their communities certainly have a lot of choices. In Illinois alone, nearly 40,000 nonprofit organizations are eligible for tax-deductible gifts, according to the federal Internal Revenue Service. That list includes churches, little leagues, social service agencies and philanthropic causes of all kinds. With so many options, it may be hard to identify just the right place to put your donation. That’s why leaders like Robin Doeden, executive director of McHenry County Community Foundation, invite potential corporate philanthropists to talk it over with an expert. Doeden and her team act like a funnel, helping to match up willing donors with important causes affecting McHenry County. When Doeden got a visit from TC Industries, a Crystal Lake-based manufacturer and specialist in commercial heat treating, company leaders had already identified their philanthropic cause: a college scholarship program for employees’ children. Through Doeden, TC Industries established a fund at McHenry County Community Foundation (MCCF) that would apply only to its scholarships. Now, students send applications to a volunteer committee at MCCF that reviews applications and makes recommendations. TC Industries writes the checks to the winning applicants. Doeden’s helped many businesses, families and individuals to support causes that are meaningful to them. Using the strengths of a community foundation, she specializes in long-term giving, through programs like scholarship funds, donor-advised funds and designated funds – all established through MCCF. Most community foundations, McHenry County’s included, use endowed funds to support long-term donation programs. For donors without the means or ambition to create an endowed fund, a more flexible alternative is a pass-through account, which requires regular replenishment. Many donors walk in with a certain idea of how they’d like to give. They often turn to options like the donor-advised funds, which allow someone to donate to any cause at any time. An alternative is the designated fund, which allows someone to support a broad cause or a specific agency. Not all donors know where they want to give – just that they want to donate. In those cases, Doeden has options. MCCF’s new Give360 program allows donors to impact the community with a minimum gift of $360. At the end of the fiscal year, donors vote on which organizations will receive half of the year’s earnings. In 2016, the top eight organizations received a total $18,000. Doeden also maintains a list of priority projects and agencies that need assistance. Based largely on the regional Healthy Community Study and input from an annual roundtable discussion, Doeden’s list enables donors to tackle head-on some of the biggest challenges facing McHenry County. Initiatives impacting homelessness, opioid addiction and youth hunger have been top-of-mind lately. A few years ago, MCCF’s priority initiative focused on veterans services. In talking with veterans, their families and local service agencies, MCCF homed in on education and veterans in need at McHenry County College. The result was a laptop program that allowed local businesses and individuals to purchase about 20 to 25 laptop computers for needy students every year. The fund was so successful that MCCF later launched a reimbursement program that now helps veterans to bridge their cash flow needs. Local businesses provided the initial investment. In some cases Doeden and her team help donors to find a meaningful investment, as she did with someone who wanted to boost literacy among low-income families. Their contribution launched a local partnership with Bernie’s Book Bank, a Lake Bluff-based organization that provides one free book a month to at-risk children through the federal WIC nutrition program. Doeden encourages all eager donors to consider their options. “Certainly, we can talk with a business and say we think these are some needs that have been identified, but I would love for a business to come to me and say, ‘Robin, this is something we really care about. How do we make it work?’” says Doeden. Much like a community foundation, United Way helps to match donors and causes, and it channels money to specific causes within its geographic area. And, much like MCCF, Barrington Area United Way (BAUW) uses its own healthy community study to identify areas of need, with a specific focus on the territory of Barrington 220 School District. Though similar in many ways, these groups also have their differences. Unlike a community foundation, United Way is more narrowly focused on causes pertaining to health and human services. And, it doesn’t operate on endowed funds. What’s raised in a year is spent within a year, says Leslie Luther, executive director of BAUW. To that end, BAUW is a key player on the Healthier Barrington Coalition, a partnership that includes local government bodies, service agencies and Advocate Good Shepherd Hospital. The coalition manages a healthy community survey and monitors the needs of area residents. Luther’s connections enable her to channel volunteers into meaningful causes, connecting them with recurring roles like serving meals to seniors or one-time projects like a Day of Caring. She’s also helping to connect volunteers with The Build Team, a local nonprofit assembling a hurricane relief mission in the Gulf Coast. Traditionally, United Way has received at least 50 percent of its funding through employee campaigns, in which employees at partner businesses pledge a cut of their salary. Those campaigns are less popular now, says Luther, so it’s imperative to find new revenue streams. For events like the Power of the Purse fundraiser and golf outings, Luther turns to local businesses for support, whether it’s donating merchandise for auction or providing financial support. BAUW remains the Chicago area’s only small independent United Way, and everything raised by BAUW stays locally. Unlike some nonprofits that hold high overhead and administrative costs, 100 percent of BAUW’s local donations go where promised. Administrative costs are covered by other means, says Luther. To help spread costs, Luther is looking at creative ways that donors can support those ongoing needs. Philanthropy and casinos don’t necessarily go together like peanut butter and jelly – but they do if you’re in Elgin. For more than 20 years now, Grand Victoria Casino has been sharing its profits for the greater good of its hometown. About 20 percent of the casino’s net operating income goes straight to the Grand Victoria Foundation every year. The foundation, headquartered in downtown Chicago, supports Illinois nonprofits working at the state, regional and local levels on employment, early childhood education, and land and water conservation. The foundation maintains three types of grants: Core Grants that support Illinois organizations seeking systemic solutions; Elgin Grantworks to support nonprofits’ operations in the casino’s hometown; and Vital Lands Illinois to support conservation initiatives. The foundation supports several networks of local nonprofits. The Elgin Partnership for Early Learning coordinates health and education programs for area youngsters. Another network draws together those who provide human services like food, shelter and counseling. A third network, Alignment Collaboration for Education, focuses on success in Elgin’s schools. The Foundation granted nearly $4.9 million in 2016, according to the foundation’s annual report. When Fishman was hired as the founding director of the foundation, she familiarized herself with numerous facets of Elgin’s community, in an effort to identify the greatest needs. “We were trying to find out how to support efforts already underway and new efforts that hadn’t yet begun,” she says. Fishman believes the impetus for Grand Victoria Foundation lies in the way the casino was founded as well as the philosophical beliefs of its ownership, a partnership between subsidiaries of MGM Resorts and Hyatt International. Corporate foundations require a serious dedication of time and money, in addition to numerous filings with state and federal officials, says Doeden, of MCCF. She believes community foundations can provide similar benefits through alternate means. Philanthropic giving may be top of mind this time of year, but this is by no means the only time to give. Food pantries are especially in need during the summer and fall, when donations slow down. Other causes may have similar down times where your support is more in demand. Experts at local United Ways, community foundations and similar organizations typically have a good sense of current needs around your hometown. Not all donors want to be known for their philanthropic support, but Luther is proud to announce who’s supporting BAUW. She makes sure to let her sponsors be known online and at events. Jensen Jacobsen & Associates is often recognized around BAUW events, especially when it sponsors gatherings like the annual golf outing or the Power of the Purse handbag auction. Sure, it’s free marketing, but that’s not why owner Patty Jacobsen lends her support. She values both the time and money she invests in her designated philanthropy. This entry was posted on Friday, November 3rd, 2017 at 12:00 pm	and is filed under Northwest Business Magazine, Top Posts. You can follow any responses to this entry through the RSS 2.0 feed. Both comments and pings are currently closed.